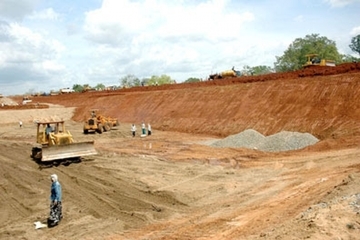 The Uma Oya Multi-Purpose Development Project (UOMDP) consists of the construction of two dams across two main tributaries of Uma Oya at Welimada and Dyraba and in a 23km long trans-basin diversion tunnels with an underground power station at Randeniya. The objectives are the generation of hydropower, irrigation, provision of drinking water and of water for industrial activities. In particular, the major concern is to provide water for the second International Airport in Hambanthota, the Industrial Zone of Hambanthota, the Hambanthota Harbour and the Oil Refinery. The project is implemented by the Ministry of Irrigation and Water Management in coordination with the Ministry of Power and Energy and Ceylon Electricity Board. The estimated cost of the project is 529 million USD but actually the project’s total costing is unclear . The 85% of the total cost is provided by the Government of Iran through a loan from the Export and Development Bank. The company engaged in the construction is the Hardish Engineering Company of Iran. The Uma Oya Multi-Purpose Development project was first proposed in 1991. However, when it was initially proposed, it was rejected on the basis of protests that it would take away the people’s right to free water and because of technical flaws in the project plan. The agreement on UOMDP was then finalized in 2008 and the Iranian President (Mahmoud Ahmadinejad) and Sri Lankan President (Mahinda Rajapaksa) witnessed signing of agreement. Currently, the project is under the Ministry of Mahaweli Development and Environment. Civil society organizations, community leaders, religion leaders, Buddhist monks and catholic Priests of Uva province held several protest campaigns against the project due to its adverse impact. Local communities fight for their right to water and claim that the underground tunnels had dried up many fresh water springs in the Uva Province. In December 2014, villages of Heeloya and Palleperuva in Ella Divisional Secretariat and Makulella, Egodagama and Weheragalathenna in Bandarawela Divisional Secretariat observed cracks in their houses, caused by the vibrations of the tunnel construction. Moreover, decreasing levels of ground water have been observed in the area. Media reported that the Central Environmental Authority (CEA) found a leak, pouring out 250 litres of water per second into the underground tunnels system of UOMDP. Even though the first part of the project has been completed, following the continuous protests the current government headed by Maithripala Sirisena temporarily suspended it and appointed a committee to study the controversial impacts . 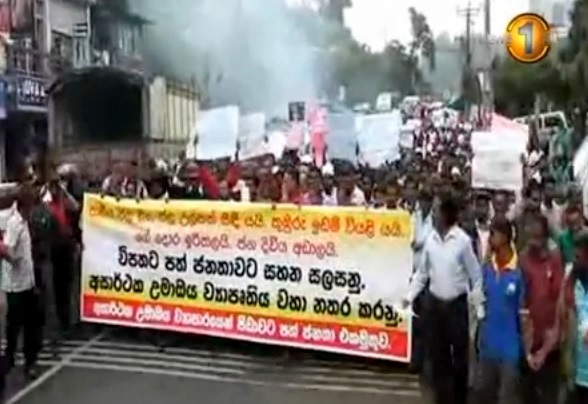 The Human Rights Commission of Sri Lanka and other Environmental Justice Organizations concerned the villagers’ protest and issues which they highlighted at the protest. Then the Human Rights Commission decided to conduct a Fact-finding Mission on the right to water and other effects on inhabitants caused by the Project . CEA carried out investigations as well and Prof. Dharmasiri (CEA chairman) declared that the project contractor violated several Environment Assessment Committee conditions. Moreover, environmentalists state that a flawed environmental impact accessment (EIA) for the first phase was passed in 2011 under government pressure. The Centre for Environmental Justice (CEJ) registered its objections over the first EIA in 2011, pointing out that the environmental cost had not been analysed properly and if the cost of resettlement was included too, the project wouldn't yield any benefits . The project is part of the development policies carried out by Sri Lanka. As many others development projects, it is causing socio-economic losses, displacement and pollution affecting the livelihoods of local communities for the profit of national and international elites. Moreover a huge amount of material and energy has been used in order to build the facilities. Following environmentalists and local authorities there is also lack of transparency in the implementation of the project. As Hemantha Withanage from the Centre for Environmental Justice pointed out ‘the Uma oya project would only scatter the communities as “development refugees” for the sake of development’ . Project Details The major crops cultivated in the areas submerged by the reservoir include paddy, vegetables and potato. A production capacity of 87.4 metric tons will be lost per year due to submersion. The corresponding loss of revenue amounts to Rs. 2.62 millions. In an area of 8 hectares of croplands and gardens submerged by the reservoir, vegetables and potato are being cultivated two or three seasons per year. A harvest of 48 metric tons will be lost due to submersion per year. Loss of revenue is Rs. 2.16 million. The other main reservoir, Dayaraba reservoir, will be built in Atampitiya. This dam is 50m high, 142m long and 6m wide. The capacity of the reservoir is 15.6 hectares. Farmlands of 69 families submerge due to this reservoir. Mainly paddy, vegetables and potato are cultivated in this area. Loss of paddy harvest duet to submersion is 65.44 metric tons per year. Loss of revenue caused by this is Rs. 1.96 millions. Croplands of vegetables and potatoes and gardens spanning an area of 14.51 hectares will be submerged by this reservoir. Loss of vegetable and potato harvest due to submersion is 87 metric tons per year resulting in a loss of Rs. 3.91 million in terms of revenue. The monetary value of the resources lost due to this project is substantial. The main crops cultivated in the areas subject to submersion due to the two reservoirs are paddy, vegetables and potato. The paddy yield lost due to submersion is 153 metric tons per year which is a loss of Rs. 4.6 million in terms of revenue. Production capacity of vegetables and potatoes is 135 metric tons. This accounts for a loss of revenue of Rupees 6 million. Company Names or State Enterprises Hadish Engineering Company (http://www.znwhs.com/site/hadishec.com) from Iran, Islamic Rep.
International and Financial Institutions Export and Development Bank of Iran (EDBI) from Iran, Islamic Rep.
Other Most of the areas to be developed as agricultural land under the Uma Oya Multipurpose Development Project are scrublands, grasslands or forests where people are often engaged in animal husbandry. With development of these lands, the areas available for grazing the animals will be limited. In turn, cattle will be taken deeper into the protected forests.